I waved at a flock of pigeons in my back yard and they flew away. We have a bird feeder and they are voracious, decimating the food before better birds arrive. Greedy fuckers. So, when I see a bunch of them munching uncontrollably, I wave my arms from inside the house and they perceive danger and take wing, panicky, flapping and flailing. It looks kind of cool and funny; I feel powerful. Today, when I waved them away they all took off except for one. 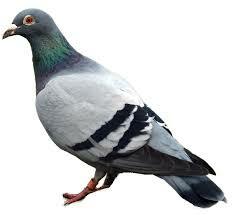 A normal-looking pigeon, average, nothing special, but it remained behind, pecking as the others split. I thought: that is one smart pigeon. He (I’m calling it a “he”) suspects that I’m not a "real" threat so he hangs back and helps himself to more seed than the rest of the birds. Advanced birdbrain. But wait. It is also possible that he’s the stupidest dude in the flock because when the rest took flight, he stayed around and put himself at risk to eat more than his share. Gluttony on an avian scale. Does he not know about cats, coyotes, foxes? He can’t be so smart that he differentiates me as a harmless harasser from the dangerous predators, can he? But seriously, I’m not sure. This is a problem with evolution. Either the most adaptable survive, or the stupidest. Based on recent observations, I’m going with the latter.